Skenfrith used to be part of the critical national defence infrastructure, guarding a crossing point on the River Monnow, one of a chain of castles designed to ensure that the Welsh stayed on their side. But that was all over about six hundred years ago, and not a great deal has happened there since. The castle is still there and so are the church and the pub (though the latter has ideas for a higher station) as well as a couple of dozen houses. But there is also a good old-fashioned phone box standing in a splendid but hardly densely populated setting. The blue panel above the door bravely proclaims “e-mail + text + phone” though a quick glance inside didn’t offer any obvious support for anything other than the last of those three. Then a few hundred yards further up the road, there is what is clearly the telecommunications nerve centre for the Monnow valley. 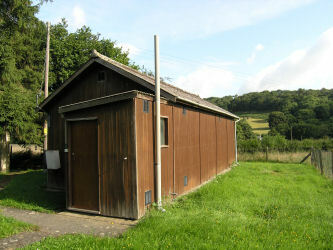 It’s a bit large for a garden shed, but it’s clearly related. It’s all a reminder that “network” means something important and tangible as well as many somethings which are also important but very much less tangible. 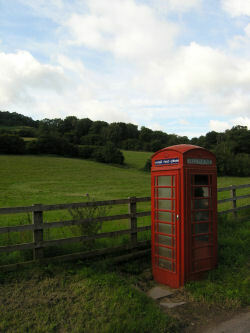 It’s hard to imagine that BT makes much money from offering email services in a phone box in Skenfrith. But that probably matters less than that the shed is there – which allows the pub-become-hotel to offer free wi-fi just a stone’s throw from the phone box.